Tennis Australia has withdrawn its support for Bernard Tomic and accused the 26-year-old of "deliberately trying to damage" the culture of the country's Davis Cup team. A feud between Tomic and Lleyton Hewitt escalated dramatically at the Australian Open, when the former followed his first-round exit by accusing Australia's Davis Cup captain of a conflict of interest regarding team selection. Hewitt subsequently claimed he and his family had been threatened by Tomic, who again hit back by calling the former world number one a "liar". On Saturday, Tennis Australia CEO Craig Tiley outlined his disappointment with Tomic. "Lleyton is right to say Bernard will not be considered for Davis Cup [selection]," said Tiley. "Bernard does not meet the standards of behaviour and commitment to himself, the team or the sport. Now, he is deliberately trying to damage that culture – and not for the first time. "Our organisation remains deeply disappointed with the ongoing disrespect from Bernard and his father. We have given more than a decade of support. Ultimately, we have to draw a line when the behaviour does not warrant the support." Tiley also responded to comments from Tomic's father, John, who stated he would take legal action against Hewitt over an alleged incident that took place in 2010. John Tomic claims his son was left traumatised when Hewitt tried to pressure him into revealing information, in the apparent belief someone at Tennis Australia was telling the youngster what to say. "In regards to John Tomic’s recent claim in the media about an alleged incident in 2010, we are not aware of any formal complaint lodged by either John or Bernard," Tiley added. 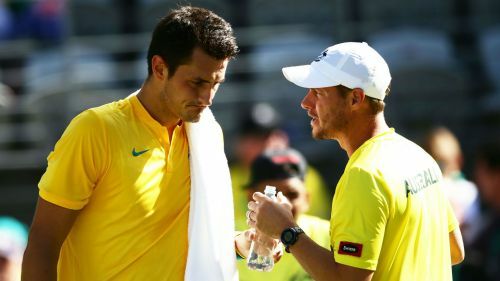 "Both Bernard and John have enjoyed a lot of support since in many areas of their lives - including a long and sustained period of personal commitment and whole-hearted effort from Lleyton Hewitt as Davis Cup captain."